Perry Como’s soothing, seductive voice emanating from the dresser-sized record player filling our living room with Christmas music was one of my favorite holiday traditions growing up. I think I was a 1950’s housewife in a previous life. His voice always stirs a recognition in my soul of a simpler, happy time. 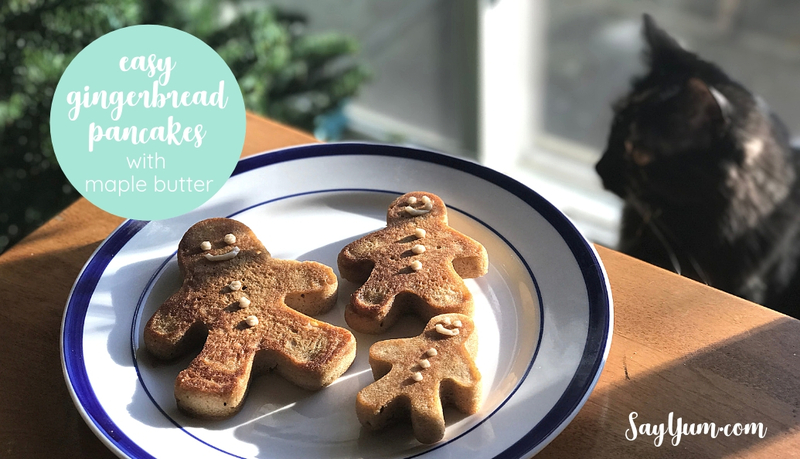 In the spirit of simplicity and pleasure during this Christmas, Hanukkah and winter holiday season, I hope you’ll enjoy this 4-ingredient, easy gingerbread pancakes recipe (made in gingerbread men or women 😉 shapes) topped with maple butter to take it to the next level! It’s a simple festive dish to get in the holiday spirit, an easy Christmas breakfast or anytime when you’re craving the warming flavors of gingerbread. After all, can’t we all use a little help whipping up festive delights easily for lazy mornings celebrating our childhood memories. This year my inbox delivered delivered delicious inspiration for adorable gingerbread pancakes. Though that recipe was simple, I immediately thought of an even easier way to pull off these show stopping wonders. 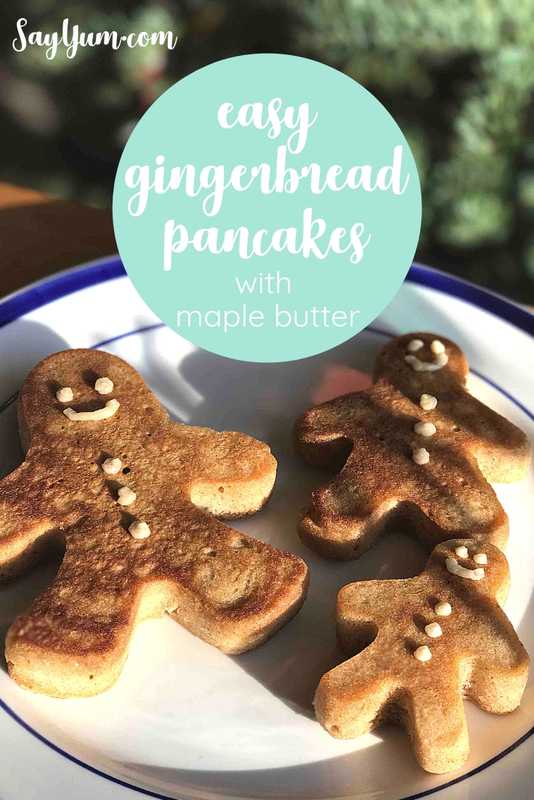 By using the pancake mix already in my cupboard and just a few other pantry ingredients, ordinary pancakes transform into easy gingerbread pancakes. It’s a recipe you can pull off anytime with minimal effort. You can easily whip these up with your favorite gluten-free pancake mix also. 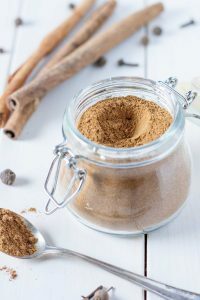 This recipe uses store-bought gingerbread spice mix, and you can also use the individual spices as listed. BUT, if you are feeling crafty, a large batch of homemade gingerbread spice mix makes a great gift when divided into cute bottles like these or baggies decorated with ribbon, festive string and labels. I love making gifts like these for friends, teachers, family and neighbors because it’s easy, cheap and people usually find it impressive. Gingerbread spice mix is a great DIY gift even for non-bakers. It’s a fun way to dress up a cup of coffee, hot chocolate, oatmeal, yogurt or add sugar and sprinkle on some buttered toast or popcorn. It took some practice to perfect the technique of filling and flipping. When making the pancakes be sure to grease the cookie cutters well so the pancakes will easily release. Fill each cutter no more than half way and try to keep it slightly under half. Check that the batter is evenly distributed in the cookie cutter. You can use a chopstick or end of a spoon to spread out if necessary. I use tongs to tap and release the pancakes in the cutter, and then to remove from the pancake before turning over. Be sure to re-grease the cookie cutters each time you make a new batch. After the first few rounds, you’ll be a gingerbread pancake master. Or if you prefer, you can always ditch the cookie cutters and make these normally. The kids enjoyed decorating the gingerbread pancakes with some maple butter. For the ‘frosting’, I took some softened butter and added maple syrup to taste with a pinch of salt. A small sandwich bag serves as a no-clean up piping bag. If you’re craving chocolate, you could also use nutella to decorate. To dress them up even more, raid your pantry for anything small like sprinkles, chocolate chips, mini chocolate, or crushed candy canes. The goal is to use whatever you have on hand. If Christmas morning is too hectic, you can also make them and freeze ahead of time. Another option is to prepare waffles as directed by the package and add the molasses, brown sugar and spice mix to the batter for gingerbread waffles! The ease of this recipe makes it a great option for an easy Christmas breakfast or any time during the winter when you’re feeling festive. They are sure to be a crowd pleaser and fill everyone’s tummies with the flavors of the season. Easy, festive breakfast for Christmas, or winter holiday season. Use store-bought pancake mix and dress up with a sweet treat, maple butter. Make it gluten-free with GF pancake mix. Preheat electric griddle to 375°F or place a large non-stick pan or griddle pan on stove over medium-high heat. Prepare liquid ingredients per pancake mix directions for 2 cups of mix. Add molasses to liquid ingredients and mix. Measure dry pancake mix into medium bowl.Add brown sugar and gingerbread spice mix or spices listed for spice blend. Add liquid mixture to bowl and mix until only small lumps remain. Place cookie cutters on griddle or pan and spray thoroughly with oil. Spoon pancake mix into each cutter filling about 1/3 full. Spread out batter to fully cover each cookie cutter. If necessary use a chopstick or end of any utensil to spread. When bubbles appear all over batter use tongs to tap and release pancake from cutter. Then use tongs to remove cutter and set aside for next batch. Flip pancake over and finish cooking until golden brown. Repeat until you use all the batter. If decorating with maple butter, wait until pancakes cool slightly before decorating. While waiting mix together maple syrup and butter, and spoon into corner ziplock bag, trim corner and squeeze to decorate as desired. * 4 ingredients based on using a pancake mix needing only water and using prepared gingerbread mix. 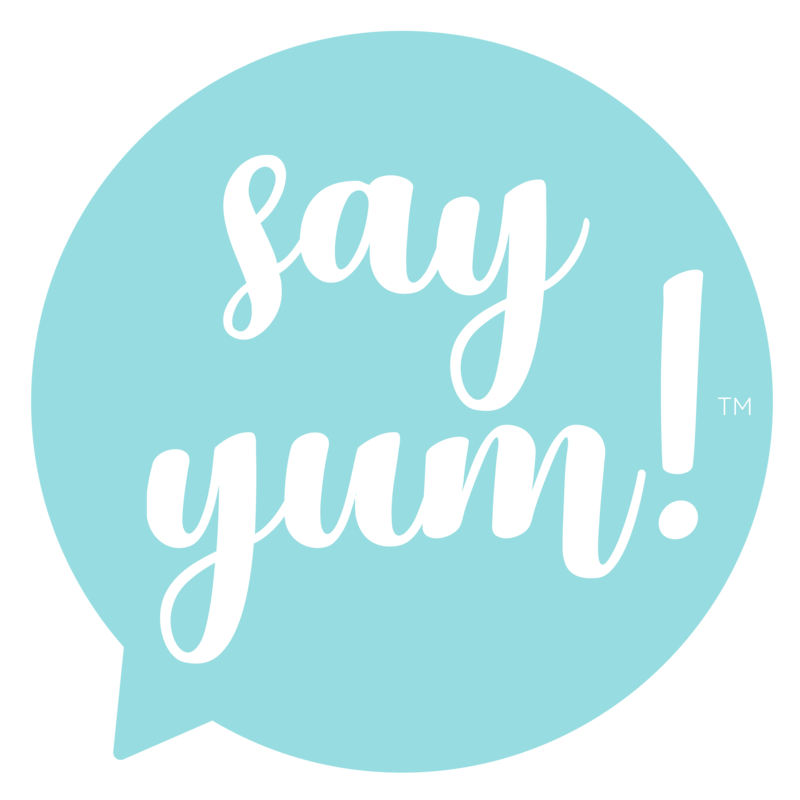 copyright © say yum™ 2005-2017. all rights reserved. Remember to take it easy this holiday season and enjoy the moment.